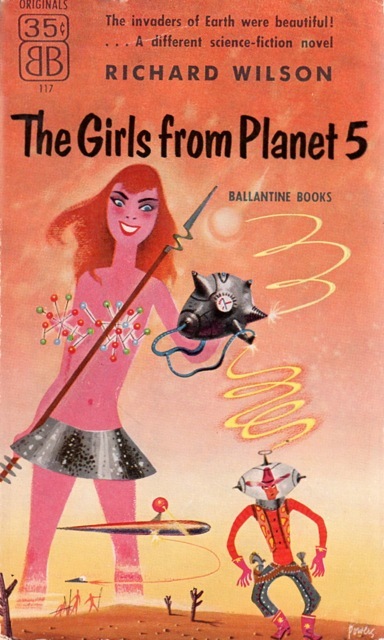 Thus begins Richard Wilson's immensely entertaining novel of the host of lovely ladies from outerspace who invade a U.S.A. already dominated by women. It's as exciting as it is deft and entertaining. "The women had taken over by 1998 but this had never bothered Dave Hull personally until just now." And I just had to buy it. (Even though I don't read much science fiction.) Call it a bookish impulse. I don't know if it's any good or not, but it made me smile. And any day with a new book in it is a good day, don't you think? Oh. My. Goodness. Will hold you to a report on this one! I haven't started it yet, but I promise I'll let you know if it was worth the $2. Haha, that looks like a lot of fun. I hope you enjoy it! What a find! Hope it turns out to be a fun read. A great opening line! Can't wait to hear about the rest of the book. I'm a couple chapters in and it's pretty funny so far; definitely a book that does not take itself too seriously. That is such a fun looking book. I would have picked it up just because of the cover, for certain. I know, right? How could anyone resist a cover like that?